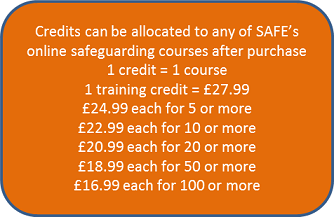 SAFE operates a training credits system where organisations can take advantage of volume discounts by purchasing a number of credits that they can then allocate to courses as required. Credits do not expire and can be used by allocating them to individuals in the establishment at any time. Should individuals leave the organisation having not started the allocated course SAFE re-credits the organisation with the unused course. SAFE supports its clients via a number of channels, including an online real-time interactive chat tool, email and telephone during normal office hours. 1 training credit = 1 training course. When you click 'Buy Now' simply change the number of credits to the number of courses you require. For example, if you require only standard child safeguarding as do the majority of staff, then a single credit per employee will suffice. If you are the designated lead or deputy you will require two credits to take both standard child safeguarding and leading on child safeguarding. If in doubt call us on 01379-871091. Every member of staff also needs to take annual eSafety training and SAFE's online version of this course can be purchased directly from the website. This course is essential for all those in the field of education who volunteer or work directly with children, young people or their families. Compliant with the latest legislation, government guidance and with direct links to your local Safeguarding Children Board , this course covers everything staff need to know about what might concern them, how to respond to concerns appropriately and consider safer working practice. A certificate will be provided upon successful completion of SAFE online training courses. Certificates can be downloaded and printed at any time and remain valid for two years. This course is specifically developed for the senior designated lead in educational settings and is compliant with the latest legislation and government guidance. The course includes links to your local Safeguarding Children Board. It also covers the key aspects of managing safeguarding arrangements including child protection and other vital policies, identifying concerns and making referrals, handling allegations and complaints and elements of eSafety. * Completion of the SAFE CIC Standard Child Safeguarding course (or equivalent) is a pre-requisite. The training meets Ofsted requirements. If you require more than 100 online courses please call the SAFE team on 01379-871091 for a bespoke quotation. All frontline staff now need to be aware of the Prevent Duty under the Counter-Terrorism and Security Act 2015. Click here to get your FREE online government training.